this seemed like the perfect contribution to craft for hope, reminding me that we are all one, as human beings in this universe. united in love. especially in times like this. a dear gift for your beloved this valentine's, with extra special significance. this little pillow is constructed from 100% wool recycled/upcycled/reclaimed suit coat, and backed with 100% cotton recycled/upcycled/reclaimed light blue knit. a wool i-cord loop is attached for hanging - on the wall, or maybe next year's tree? scented with soothing lavender essential oil. the pillow is also stuffed with 100% wool recycled bits (from sweater clippings). 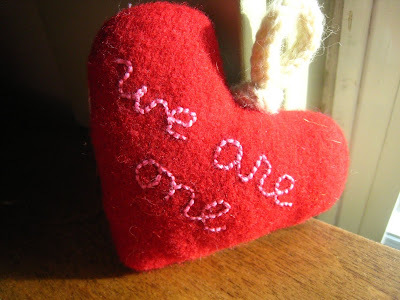 i am sorry to say that i cannot afford to offer international shipping on this because it is prohibitively expensive for me, but i will offer more 'we are one' hearts in my shop with international shipping, and all proceeds to haiti via 'partners in health'. blessings to you and yours. if you would like to donate an item, please follow this link for instructions. if you are shopping, please visit the Craft Hope for Haiti Etsy shop, which benefits Doctors Without Borders.